Climate change is a salient issue amongst Democrats. There is an environmental section as a part of the Democrat’s official party platform, and a poll conducted by Monmouth University in November found that 82 percent of Democrats believe climate change is a “very serious issue.” Although Republican voters and elected officials alike are coming around to the idea that climate change is a clear and present danger (64 percent of Republicans acknowledge climate change, up from 49 percent in 2015), the Democrats have championed themselves as, for lack of a better term, the Green Party. 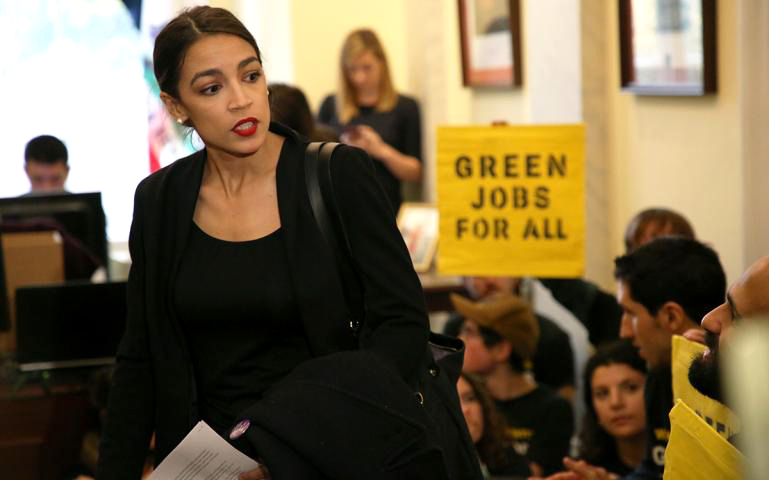 Yet, Democrats are shirking away from the Green New Deal (GND) legislation, put forth by freshman House of Representatives member Alexandria Ocasio-Cortez (D-NY) and junior Senator Ed Markey (D-MA) in early February. First-year and Sunrise Movement volunteer Alexis Worth said, “It’s degrading that she didn’t even care to listen to our opinions, and it’s our future. The current political climate is so polarized, but I think something like the GND, where it’s just pushing all of that away and saying ‘what about our futures?’ It doesn’t matter if you’re a Republican or a Democrat.” Many were shocked by the tone-deaf response, but the encounter is symbolic of the greater issue of political will in Washington, ... Feinstein and many other members of Congress have been legislating for over thirty years, and their constituents are still waiting for bold action to combat climate change. Why do we even need the GND? To start, the U.N. Intergovernmental Panel on Climate Change (IPCC) released a report in October saying that we only have 12 years to make dramatic changes in the way we approach climate change, or we will face catastrophe. Evidence that climate change is both underway and man-made is certain; earlier this week, a team of scientists in Natural Climate Change said we have reached “gold standard” levels of confidence. This means there is only a one-in-a-million chance that similar data would appear if there was no warming. Nobody ever said that environmental change would be easy or cheap. The IPCC report called for “rapid, far-reaching, and unprecedented changes in all aspects of society.” Enter the GND, which goes beyond decarbonizing the U.S. and pushing for zero emissions by 2030, outlining a world that includes infrastructural, economic, and social justice programs. The broad scope and ambitious nature of the GND has drawn many skeptics; in the last two weeks, pundits have been going back and forth debating the affordability and likelihood of the GND’s successful completion. We do not have time to be timid, or to take gradual steps the way that some lifelong politicians would like. We do not have time for egos like Feinstein’s; the planet does not have time. We need bold, progressive legislation that will move this country closer to zero carbon emissions, closer to well-paying green jobs, closer to clean water and air. To speak plainly, the climate crisis pundits are needling about back and forth, is already here. Climate Analytics confirms that the Earth’s temperature has already risen one degree Celsius since pre-industrial times. This may not sound like much, but a singular degree has massive impacts on our world’s oceans, forests, and animal life. Corporations are not going to shift gears on their own, not at the rate or with the intensity we need them to. Green energy and environmentally-friendly business practices are more popular than they have ever been before; Forbes predicted that electric vehicles would likely “represent at least 65 percent of sales in 2050, and with strong technology cost declines or high oil prices, could represent 70 — 75 percent of sales in that year.” Here in Whittier, 50 percent clean energy became the default plan for all residential energy consumption, through a partnership with Clean Power Alliance and Southern California Edison. That’s all great, really, but it’s not drastic or systematic enough to prevent a global disaster. It’s difficult to talk about what is a reasonable or moderate policy, whilst discussing the biggest and most pervasive issue in the history of humanity. The GND sees all of this, sees what is currently being done and how far we still have to go, and gives us a chance to make real progress in terms of tackling not only climate change, but also the socioeconomic inequalities it creates. Whatever the price tag on the GND, the price of worsening storms, coastal erosion, water contamination, raised salinity in our ocean waters, environmental degradation, (and honestly, I can keep going) is far higher. “It’s our future, at the end of the day we need progressive and aggressive action towards climate change, and it shouldn’t matter how much it costs. It would be miserable to live with the temperature continuing to rise and the pollution being so horrible,” said Worth, who is hoping to motivate students on campus to support the GND as well. The GND has an uphill battle in both the House and the Senate, then again at the President’s desk — and that’s even before implementation begins. However, the GND has sparked interest and conversation behind environmental policy in a way that nothing else ever has. The idea that groups of kids and their parents would make the trip to their Senator’s office to talk about climate change would have been laughable two years ago. Even if the GND is not successful in its first pass through Congress, the fire that has been ignited is not going away. Either we’ll use it to fuel our hopes and dreams for the next generations, or that flame will burn our houses down. I’m hopeful though, and that’s something I couldn’t say about environmental policy prior to the GND’s introduction. Americans want action to prevent climate change, and when voters push hard enough, their elected officials tend to want action, too — and that’s the art of the New Green Deal.